Announcing the Rockn' to LOCKN' Semi-Finalists & Live Playoffs! Congrats to Our Top 12 Rockn’ to LOCKN’ Semi-Finalists! Dreams are getting closer to reality! 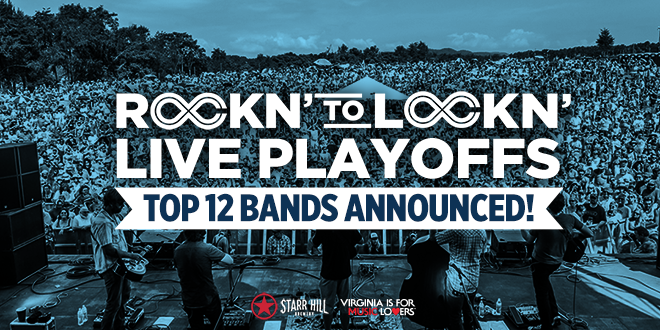 We’re super excited to announce the 12 finalists from the Rockn’ to LOCKN’ fan vote! Congrats to Anthony Rosano & the Conqueroos, The Atkinsons, Big Mama Shakes, Mighty Joshua, Sun Dried Opossum, Kendall Street Company, Adar, Will Overman Band, Galaxy Dynamite, Devil’s Workshop Big Band, FeelFree, and Virginia Man. These bands will be going on to perform at the live playoffs at three Virginia shows on April 14, 21, and 28, presented by Starr Hill Brewery. It’s your vote that gets them into the next round (and you must be at the shows to vote), so come out, treat your ears to new and original music, and support our local venues and bands! Plus there’s a good chance for you to win some LOCKN’ tickets and sweet swag, courtesy of our fine friends at Starr Hill, Virginia is for Lovers and more! Now it’s completely up to you to determine which bands move on to the next round! Bands who get the most votes at the live playoffs will advance to the Finals, which will be held at Community Day at Infinity Downs Farm on Saturday, June 17 (tickets available HERE).